NETWORK FINALS: Final numbers were a mixed bag for ABC, as AMERICAN HOUSEWIFE gained 0.1, but both REAL O’NEALS and AGENTS OF SHIELD dropped the same, putting the latter at 0.7, which is the same level where the shows in that slot the past few seasons were getting canceled. On NBC, THE VOICE gained 0.1 and CHICAGO FIRE lost 0.1. 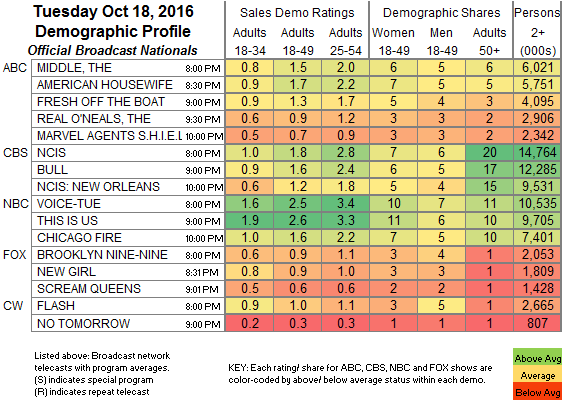 Note that NO TOMORROW held its 0.3 from this morning, which at least kept it slightly above last week’s final rating. CABLE HIGHLIGHTS: Fox Sports 1’s Dodgers vs. Cubs BASEBALL PLAYOFFS game dominated Tuesday cable at 1.89, while TBS’s Blue Jays vs. Indians afternoon game was at 0.64. On USA, WWE SMACKDOWN added 0.02 for 0.81, and CHRISLEY KNOWS BEST was also up 0.02 to 0.71. Spike’s INK MASTER gained 0.02 to 0.59, and the REDEMPTION after-show was at 0.37. Bravo’s BELOW DECK fell 0.07 to 0.57. OWN’s IF LOVING YOU IS WRONG slipped 0.03 to 0.54. On History, FORGED IN FIRE dropped 0.04 to 0.45. FX’s ATLANTA rose 0.07 to 0.44, particularly impressive given last week’s formally daring episode. Nickelodeon’s LOUD HOUSE just missed the Top 10,at 0.38. TLC’s COUNTING ON lost 0.02 to 0.38, OUTDAUGHTERED was at 0.22, and SWEET 15 was down 0.02 to 0.16. On Food Network, CHOPPED gained 0.05 to 0.36, and CHOPPED JR was down 0.03 to 0.24. Comedy Central’s TOSH.0 fell 0.03 to 0.34, and DRUNK HISTORY was down 0.07 to 0.26. 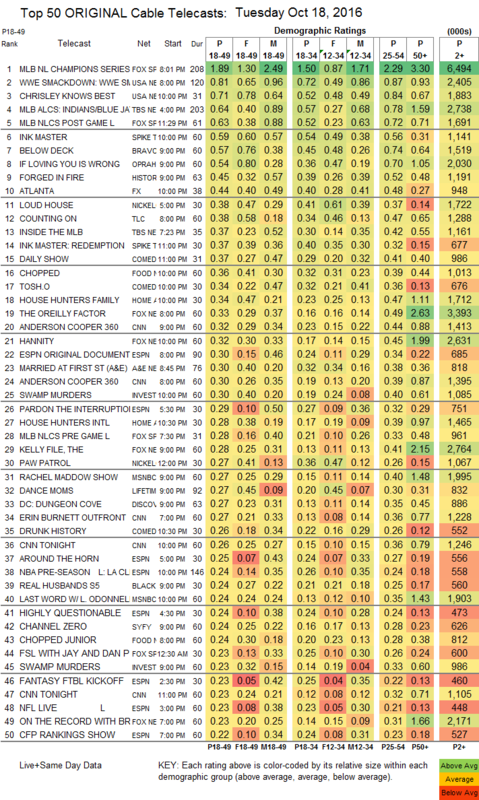 HGTV introduced HOUSE HUNTERS FAMILY at 0.34, and HOUSE HUNTERS INTL ticked up to 0.28. A&E’s MARRIED AT FIRST SIGHT dropped 0.02 to 0.30. Lifetime’s DANCE MOMS fell 0.05 to 0.27. Discovery’s DEADLIEST CATCH DUNGEON COVE ticked up to 0.27. BET’s REAL HUSBANDS rose 0.02 to 0.24, THE GARY OWEN SHOW held at 0.21, and INK, PAPER, SCISSORS was down 0.02 to 0.14 . On Syfy, CHANNEL ZERO dropped a tick to 0.24, and AFTERMATH was up 0.05 to 0.20. Freeform’s BEN & LAUREN ticked down to 0.16, and THE LETTER (off the chart) held at 0.06/119K. MTV’s SCREAM, which was just renewed for a truncated 6-episode Season 3 with new (as-yet unnamed) showrunners, aired a 2-hour Halloween special at 0.14.